Mayan Death Robots out now! Mayan Death Robots (MDR) by proud FLEGA member Sileni Studios is available on Steam as of today (November 20). 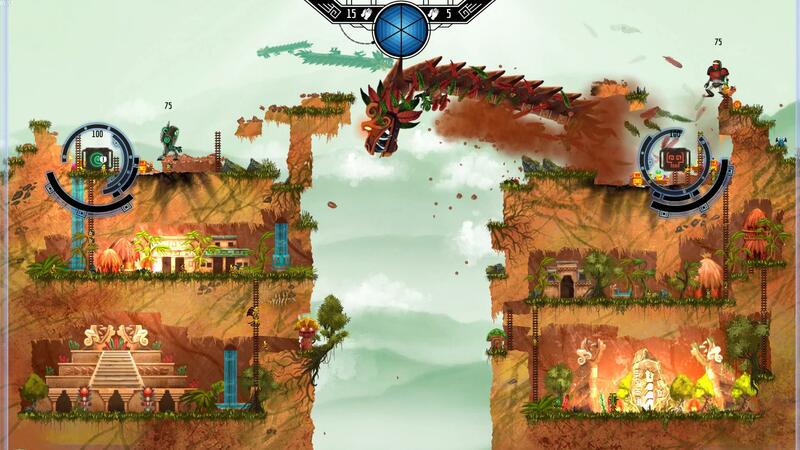 The game reinvents the artillery genre (think Worms) in a Mayan setting invaded by heavily armed, alien robots. As a player you get to pick a robot with unique abilities and weapons from a roster of ten lethal killing machines and take on the robot of an opponent (AI or human). The aim of the fight is to destroy your opponent’s power core before the timer runs out. Your reward? Aside from the pure pleasure of causing massive destruction and mayhem, the tiny Mayas will think you are a god that has descended from the heavens and worship you for your awesome powers. But beware: the actual Mayan gods won’t take your blasphemy lightly and come crash the party from time to time. When this happens, it’s best to temporarily set aside your differences with your opponent and team up to defeat these massive creatures. Although MDR is clearly inspired by games like Worms, it also contains a lot of fantastic, original features e.g. you can shape the environments to your liking with Tetris-like blocks and – our favourite feature of the lot – there is no need to wait your turn. Each player acts at the same time, so whenever your fire a shot, expect a swift and deadly retaliation.